Each week during the summer, more than 90 drivers compete on one of the toughest, flat, quarter-mile short tracks in the country during Thursday Thunder presented by Papa John's Pizza at Atlanta Motor Speedway. It's expected that a majority of the roster of competitors and their hometowns reads like a mileage sign on the side of a Georgia highway listing towns within a short drive from the track - Griffin, Locust Grove, Milledgeville, Monticello, Social Circle, Suwanee and Hampton to name a few. And while many drivers call Atlanta Motor Speedway and the State of Georgia home, there are many more competitors who travel hundreds of miles to compete each week at Thursday Thunder. Some drivers will not even come close to logging the amount of miles to and from the track during the entire summer that Associates Group Insurance Young Lions Division competitor Austin MacDonald of Pictou, Nova Scotia traveled just to get to Georgia. A one-way trip from Pictou to Atlanta Motor Speedway clocks in at 1,747 miles. "Atlanta Motor Speedway has some of the best competition around so to learn the most, we come here to race", explained MacDonald. MacDonald got into racing back home thanks to his grandfather, Rollie MacDonald, a super late model racer who first introduced MacDonald to the sport. "My grandfather has always raced super late models so I'm hoping to one day get into that and he's always gotten me involved. I've been at the tracks since I was about four years old." MacDonald has made the journey to the states for more organized, fun, and educational racing programs at Charlotte Motor Speedway, Wake County Speedway, and of course, AMS. "The people down here make the racing what it is", said MacDonald. "The Atlanta Motor Speedway officials are nice, and it's very professional down here. Back home, it's not quite as fun". The professionalism and competition is what helped draw Semi Pro driver Sammy Smith to race in the program, a journey of over 927 miles from Des Moines, Iowa to AMS. "There's a lot of competition here, the best in the world come here to race, and the track is a tight, short track that adds to the competition." Smith made his start in go-karts when he was nine years old. At just 14, he has proven himself worthy to Ladyga Motorsports, a North Carolina team well known for producing the best drivers in the Legends racing world. Smith has big shoes to fill on this team, as they have boosted drivers such as current NASCAR star Daniel Hemric to motorsports fame. 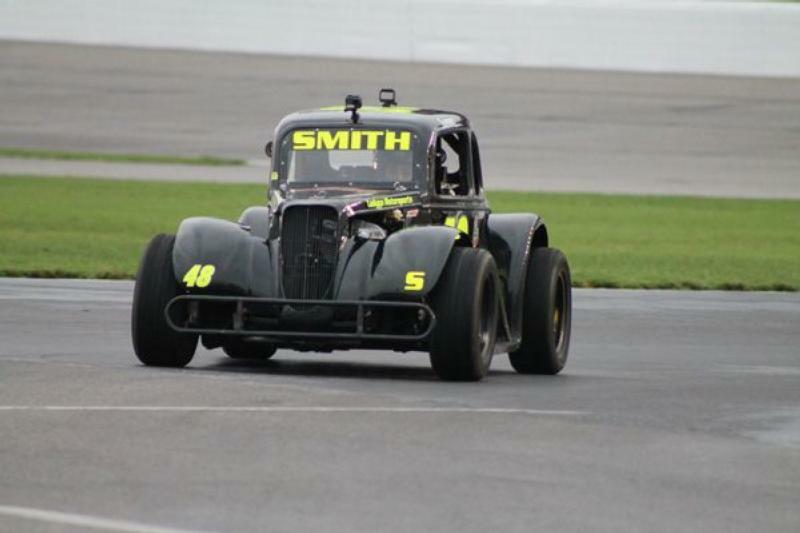 Smith is determined to make it in the sport, traveling across the country each week to race in Legends programs at Elko Speedway in Minnesota, Charlotte Motor Speedway, and the Thursday Thunder program at AMS. "I'll fly back home on Friday to race at Elko then back here on Monday to go racing in Charlotte on Tuesday, then race here on Thursday", explained Smith. Racing far from home can be difficult as Sammy Smith explains, "It's tough sometimes, you miss your family and friends, I mean my dad is the only one that comes with me during the summer." For others, such as Austin MacDonald, life in the southern racing world is the perfect fit, "I wish this was my fall home too, I wish I could live down here. I love it!" Both MacDonald and Smith have realized that in order to fulfill their dreams in racing, moving and traveling around the country is a necessity. "My ultimate goal is to make it into NASCAR", says Smith. "That's why I'm here." "I'd like to go all the way in racing, maybe someday be seen as a NASCAR driver, MacDonald stated, "but I'm just trying to have some fun out here and learn as much as I can." Both drivers will race weekly at Atlanta Motor Speedway's "Thunder Ring" and will be on hand for week eight action of the Thursday Thunder Legends Series Presented by Papa John's Pizza. Each driver has two wins in their divisions. MacDonald currently sits 13th in his points race, while Sammy Smith sits 14th in his. Both competitors will continue to battle for points and wins to make up ground in their championship hunts. Through the first seven weeks, 18 competitors outside of Georgia, including MacDonald and Smith, have competed on the "Thunder Ring". As the competition heats up as the season winds down, more are sure to follow. The 2018 season will run each Thursday night through July 26, before wrapping up with a special-edition Saturday Championship Night on Aug. 4.